WE APPRECIATE YOUR BUSINESS - CALL US AT 813-875-8805 FOR ANY QUESTIONS. 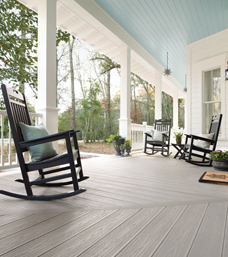 If you’re looking for Trex® decking materials, look no further as Peninsular Lumber is a local dealer with one of the largest selections of Trex Decking. The possibilities you’ll find with Trex begin where form beautifully meets function. Because there’s so much more to your ideal oasis than the deck, our wide range of products adds foresight to technique, standing for outdoor living in the most innovative way possible. Even though your deck’s substructure may not make the family photos, it’s actually the most important part of your new outdoor space. Our high-performance steel beams, joists, tracks and deck support posts create the strongest, straightest and, yes, greenest structures down below. 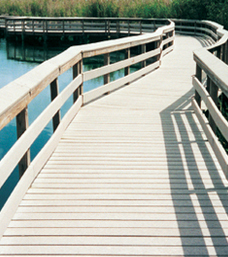 Of course, Trex’s unmatched decking and railing collections are industry benchmarks. But with aluminum railing that expands your view, steel substructures as advanced as our decking, and tough-as-nails white fascia to crown any space, you can finally apply our expertise not just to decking, but to living. Spending time outdoors feels a lot better when you’re helping t o preserve the outdoors. Trex was built upon green principles and values, from recycled materials to sustainable processes. In f act, Trex reuses as smartly as possible, creating innovative, new products from not-so-new beginnings and, of course, screening everything closely for quality before it goes near a Trex plant. Trex products made from 95% recycled materials save around 400 million pounds of plastic and wood scrap from landfills every year. Trex hasn’t felled one tree in all their years in the decking and railing business. Trex offers earth-friendly manufacturing processes recycle factory runoff and refuse back into the manufacturing line, and some plant hydraulics are even powered by vegetable oil. 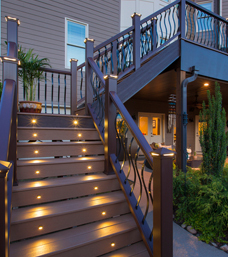 Trex decking, railing and steel deck framing contribute to LEED points on any building.